Heat oven to 425ºF. Spray baking sheet with nonstick cooking spray. Unroll dough on work surface. Press dough out with fingers to form 12x8-inch rectangle. With floured 2-inch holiday-shaped cookie cutters, cut dough into shapes. On baking sheet, place shapes 1 inch apart. Bake 5 to 7 minutes or until light golden brown. 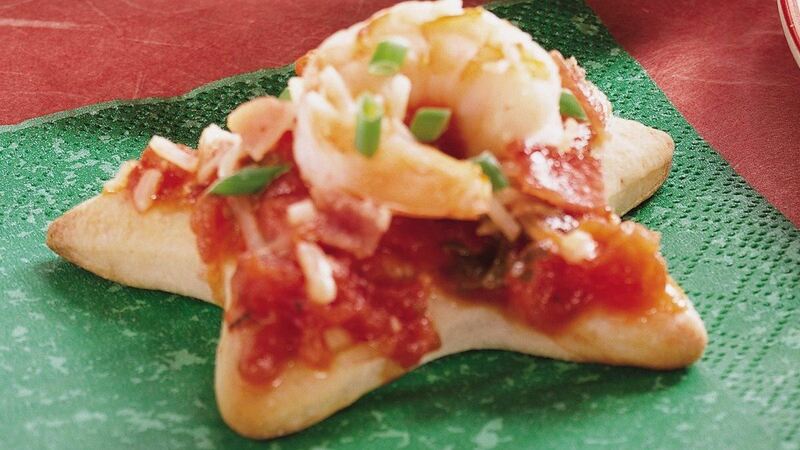 Spread each crust with marinara sauce. Sprinkle each with bacon. Place shrimp in center of each. Sprinkle each with cheese. Bake 3 to 5 minutes longer or until cheese is melted. Serve warm. Special Touch : Just before baking these canapés, sprinkle them with chopped fresh basil or parsley. Variation : To make Spicy Marinara and Shrimp Canapés, add a sprinkling of crushed red pepper flakes or a few drops hot pepper sauce to the marinara sauce. Use Genoa or cotto salami in place of the bacon.